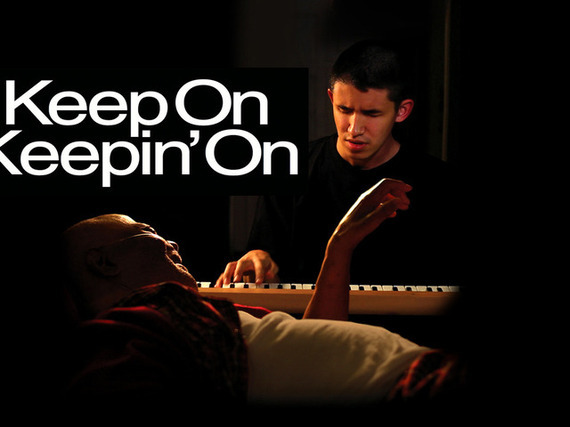 Keep on Keepin' On is a beautiful film about the love of friendship. It is a poetic film about mentoring, loving life and honoring musical talent. It is an intimate portrayal of Clark Terry, often referred to as "CT" and he is perhaps the best trumpeter that ever lived. At 93 years old and in frail health, he is still sharing and teaching. It is a brave movie. It portrays life as it comes -- the good, the bad and not always pretty. The documentary showcases the talent and genius of Clark Terry and the caring and beauty of Quincy Jones. Clark is a prophetic award winning jazzman that has help define jazz as an art form. Among his credits are the Count Basie Orchestra and the Duke Ellington Orchestra. He was the first African American staff musician at NBC. He played on the Johnny Carson's Tonight Show. His first student was a young Quincy Jones, who took lessons with Clark before he went to school and after Clark had worked all night. They found their common hour early morning. Another student of Terry's was Miles Davis. 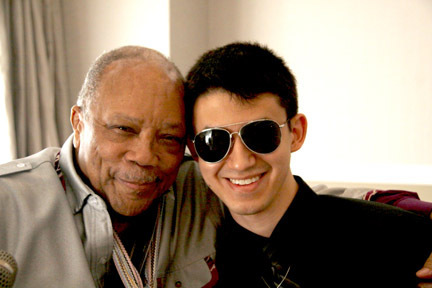 Terry left the Ellington band and began to play with the Quincy Jones Orchestra, a high compliment to his student. Terry is clearly a master teacher whose wit and hipness extends far beyond music. He teaches life. The documentary took 5 years to make by first-timer young Australian filmmaker, Alan Hicks. Later on Quincy Jones came aboard as a producer. This poignant story of Clark Terry, weaves his awards, performances and his struggles of life into a beautiful intimate portrait. It traces Clark from a child of 5 years old, making his very own horn. Terry works with a young prodigy, Justin Kauflin. Blind with a hereditary disorder since 11, he wants to be a jazz pianist. Clark helps him find his musical voice. He tells him from the bedside (his vision was failing from diabetes) how to play his instrument. The bedside scenes are touching. Theirs is a friendship of mentoring and the master teaching a wonderful student. They form a strong bond like father like son. They speak in a jazz language that oodles and improvises and is forever hip. Clark is loosing his sight. They communicate beautifully through their music, about six decades apart. Kauflin visits with Terry in his Arkansas home on and off as he goes to New York to find his musical way. He enters the Theloinus Monk Contest. He is diligent in his preparation, but he losses the competition. Terry tells him how to cope with his loss - keep on moving. You tried and you now have an experience under your belt. Keep on keeping on. One of the most touching scenes in the movie to me is when Justin is in his hotel room. He is a bit nervous before leaving alone for the auditorium. A package arrives. It is a pair of socks from Clark's wardrobe with a note of encouragement, providing Justin with just the right moxie to conquer the stage. One day Quincy Jones unexpectedly comes to visit Terry at his bedside. Their connection is uniquely syncopated. Terry has had both legs amputated due to diabetes. The musical master CJ introduces Quincy to the young prodigy Kauflin. He has the opportunity to perform for Quincy in Clark's living room. What happens is simply magical. Months later the young pianist gets a call from Terry. He tells him that Quincy Jones wants to take him on a world tour. Kauflin's life changes and his dreams are realized. He is with another master. We see him play at the Montreux Jazz Festival in Switzerland. Clark matched his students, appropriately. This is a sensitive tale and is bound to make you cry. It is delicate and a lovely story all about love. The love of jazz, the love of friendship and how lovely life can turn out to be. It is a unique tale. It is real. It is the story of a jazz musician and the love of his music. It is a story of humanity and shows greatness beyond music. This is a story with life lessons. "Keep on Keepin' On"
Keep on Keepin' On appears in Chicago at a limited engagement. I went opening night and the treat of the evening was Mr. Justin Kauflin playing for the audience. It is playing at the Music Box Theater, 3733 North Southport.